Rising community concerns about the treatment of animals and the leath of Australia’s natural environment. 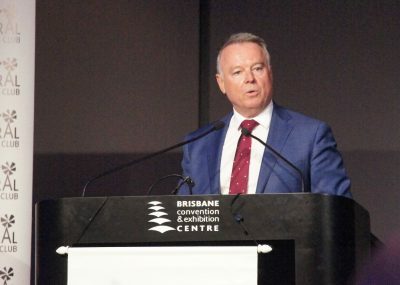 MP Joel Fitzgibbon might have a bit of a selective memory in making the statement the live cattle trade has been “meeting community expectations on animal welfare issues since 2011”. Who can forget the horrific footage of Australian cattle being bludgeoned to death with sledge hammers in Vietnam as recently as 2016 long after ESCAS was introduced. Animal welfare issues aside, the cattle industry has been doing it tough over the last 5 years and with the recent weather events in North Queensland the situation is not going to improve anytime soon. Both processors and live exporters will be competing for a rapidly shrinking pool of suitable stock. While this might be seen as a window of opportunity for producers a more sustainable long term solution has to be achieved. The ALP and Mr Fitzgibbon would better serve the Australian public by promoting onshore processing ,creation of jobs and securing the future of rural communities in regional Australia. The ALP would be better off reinvigorating the CSIRO and investing in research in tropical pasture management and lot silage feeding of cattle to improve weights and finish. Investment in water security and a transport system that would facilitate easier movement of cattle into southern markets. Typically Northern Australia has been a price taker for lower quality animals into lower priced markets but it does not have to be that way. Value add to the animals here in Australia and not allow that premium to float over the horizon on the back of a boat. Australia desperately needs a Government with vision a Government that will put Australian jobs and Australia’s interests at the forefront of the policy making process. Beef processing is the largest manufacturing industry we have left and is critical to the survival of regional Australia. Without an holistic vision for our industry producers will be left at the mercy of the live exporters with very little completion from anyone else. Wake up Australia we value add very little in this country take our iron ore our coal our bauxite our natural gas. Don’t let cattle be added to the list and beef processing becomes a distant memory like what has happened to so many of our manufacturing industries. Beef processing must survive. The future of Australia depends on it. So the cheque’s in the mail on not using knee jerk responses on live cattle trade hmmm…. unlike last time??? And speaking of politicians running to the camera to reinforce the negative message, well that’s never happened with the Labor party in government! Except last time. We may be forced to find out but we won’t be sucked in with hollow promises in the meantime. I think Labor will do what urban people tell it to do as urban votes > rural votes. They will not have the backbone to tell the urban activists they are wrong and to shut up. If air vents were turned off deliberately in order to create the video, how can any one know they weren’t turned off on several trips to create similar situations. I cannot see why live export sheep farmers should be penalized when there can be no guarantee this person or people concerned have not been turning off vents for several trips in order to earn money from the AA.